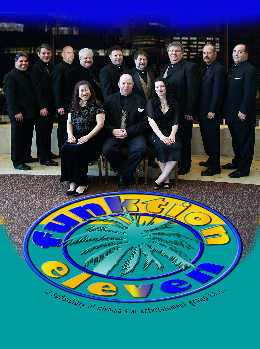 Funktion 11 is an incredible twelve piece showband featuring a hot four piece horn section, a rock solid five man rhythm section, and three lead vocalists that are nothing less than amazing. With several members singing leads and harmonies, we deliver a rich, horn-driven funky rhythm & blues sound that smaller bands just can't match. Make no mistake. This is NOT just your typical wedding band and absolutely not your average sit-down band!!! Funktion 11 serves up a powerful dose of soulful sounds that gets people up on their feet dancing all night long! By combining a wide-ranging group of musical tastes and personalities we create dynamic, soulful versions of the best popular music - a high-octane mix of funk, dance, jazz and feel good rock-n-roll driven by two outstanding percussionists! Of course we can play any of your favorite ballads and oldies as well! Our contagious "gotta dance" sound is perfect for any occasion or event. Whether a wedding reception, Bar/Bat Mitzvah, corporate event or public dance club, the music we play has a depth true to the original rendition you fell in love with in the first place.